The shift in attitudes among Millennials compared to other American generations is substantial, contributing to a huge shift towards technology that has impacted their own group and society at large. Generally regarded as the generation behind the speed at which technology-driven attitudes are accepted into the mainstream, Millennials have been the catalyst for change as they utilize the latest in innovative tools in the workplace and beyond. Their resilience has not only re-defined how companies do business and market their products and services to the general public, but also human interaction. As the only group born completely immersed in a digitized world, Millennials’ attitudes towards technology are dramatically different, with most beginning to use computers by kindergarten and the vast majority using email at least once a day. Social media has played an important component of their lives for many since they were toddlers and has only increased over time. Referred to as digital natives, their access to the internet and information has resulted in more expansive attention ranges, increased active learning, improved critical thinking skills, and more tolerance along social and political lines. No matter which generation, the majority of people believe that the internet has personally benefited them and positively impacted society. Even baby Boomers and those from the Silent Generation generally agree that the internet has been an overall boon for the world. Recently, however, the average American has had slightly less positive views of the internet compared to only a few years ago. The most affected group under this are Gen Xers, with just under 70% positing that the internet has improved society at large. Even among the Silent Generation and Millennials, those that go online are slightly less optimistic compared to studies from only five years ago. The fact remains that there must continue to be steps taken to stay competitive as innovation emerges. As the future leaders of the world, it rests on the shoulders of Millennials to ultimately decide how influential technology will be on their lives and the world. 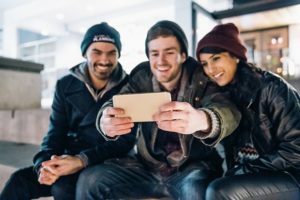 Although Millennials are comfortable using technology at home, in social settings, and in the workplace, other generational groups are still trying to make up the divide that currently exists between them and their younger counterparts.